7 Steps for creating the Perfect Valentine's Day Outfit: Part 1 ~ Roses and Rain Boots . The post you have all been waiting for is finally here! I know Valentine's day is an EXTREMELY touchy subject whether single or in a relationship it is a lot of pressure. However, it is a good excuse to get dressed up and grab a bite to eat with your sweetie or bestie. Today's post is all about how you can create new looks using two key pieces that are already in your closet. Step one: grab a turtle neck sweater and cute flirty skirt. I've selected my favorite J.Crew turtle neck sweater and my go-to flippy skirt from Stitch Fix (also pictured here) (similar skirt). And... what's a Valentine's outfit without some red? In order to get in the holiday spirit I added my red bow Valentino bag! A very close family friend was so sweet and passed this beauty along to me, I am so grateful. Step two: add a statement bag. OH, and you can also add some sunnies for a chic look. 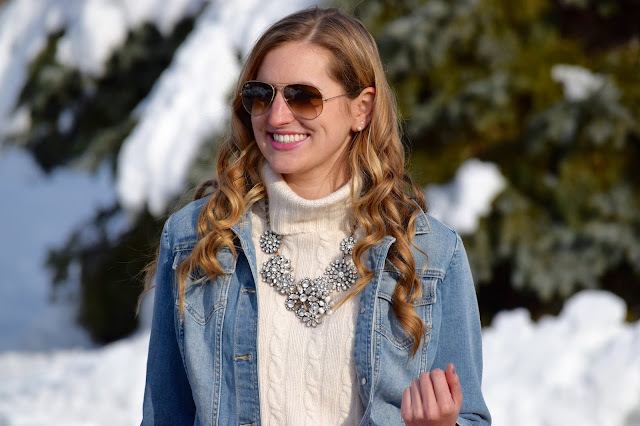 Step five: add your favorite statement necklace. Step six: treat yourself. Buy yourself a little something you deserve it. As y'all know I love roses so these were my treat to myself. Plus they look great in photos and make my office smell great. Step seven: let's not forget the shoes. Go ahead pull out your favorite pair, you have to look good to feel good! And now you are date-night ready.